The Hoot, a new student newspaper that, according to its constitution, intends to provide the Brandeis community with "a reliable, accurate, and unbiased source of news and information" was chartered by the Union senate on Sunday.Igor Pedan '05, The Hoot's founder and a former Justice editor, said that the publication's charter is important because it promises to cover news the Justice misses. "The existing newspaper has lost its focus on campus, neglects to cover issues of importance," Pedan said. 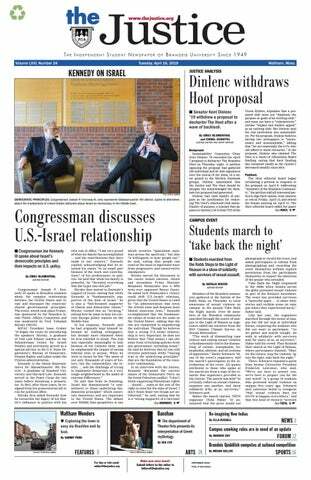 "The Hoot strives to fill the gap left by the Justice and to force that newspaper to improve while at the same time offering the Brandeis community an accurate, unbiased, and journalistically sound news outlet." According to Pedan, the newspaper is not meant as a reaction to the Justice. "There's only so much that you can do within an organization," Pedan said. "The competition will help the Justice become the paper that I think it should be." According to Pedan, the Justice does not successfully serve as the voice of the community and The Hoot would provide an alternative publication that he said would focus more on the Brandeis community. Pedan said news will take precedence over all other sections in the eight-page newspaper and that the news covered will be "just as complete as the Justice." "The Hoot intends to draw from writers who either used to write for the Justice, but seeing no progression in the organization, left, or who were discouraged from contributing to the paper," Pedan said. According to Pedan, The Hoot will print weekly and hopes to "provide a different approach" by focusing more on journalism rather than aesthetics. Pedan said The Hoot will focus more on Brandeis community events and will not include information about other schools, as given in U-Wire articles printed in the Justice. According to Pedan, The Hoot will appeal for $500 from the Financial Board per 1,000 copies for the first issue and intends to become self-sustaining based on money received from advertising. According to The Hoot's constitution, the newspaper will be divided into news, culture, opinion and sports. Its body will consist of staff writers, columnists and senior staff writers, as well as editors to manage the paper's sections. Senators had mixed reactions to the chartering of the Hoot. "Competition isn't always the most efficient thing," Senator for the Class of 2006 Mitchel Balsam said at the senate meeting. He said that he was concerned that the newspapers would "trash each other" rather than cover the news. "If they're smart, they'll appeal in a way that they'll both be successful," Union Vice President Erica Lemansky '05 said. Lemansky also said that The Hoot will have to gain the trust of the community. According to Lemansky, The Hoot will not be "filling a gap," but by having more than one news publication on campus the journalistic standards will increase. "It's always good to give students an outlet to communicate to the student body," Senator for the Class of 2007 Annie Rosenberg said. Senaotr for the Class of 2007 Jenny Feinberg said that the newspaper's chartering was premature because its founders are all officers of the Student Union and that it would require more support from the student body. Several students said that it is hard for the Justice to cover all campus events and another newspaper might be beneficial. "I think there's a need for a better newspaper on campus but I think that by creating a second one it's going to contribute to the problem that...[the Justice] is understaffed," Joshua Simon '07 said. Becky Solo '08 said that it is not necessary to have another campus newspaper but that, if it has coverage that the Justice does not include, it might be interesting.